Customizable colors, fonts, and more! We have more details and tips in our Blogger Template Designer post on the Blogger in Draft blog. We worked with iStockphoto, the leading microstock image marketplace, to put together a great collection of beautiful images and patterns to use as backgrounds on your blogs. The photos are stunning, and are free to use on your Blogger blog. That being said, today’s launch is just the beginning. We’ll add more of our own designs over the coming weeks and months and, through the new Template Design Group, we’ll be working with members of the Blogger design community to bring their templates into the new Template Designer. Help test drive the Blogger Template Designer by logging into Blogger In Draft, and learn more about the new features in more detail on the Blogger In Draft blog. Blogger and Google Reader are throwing a party at South by South West and you're invited! 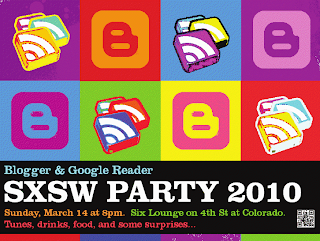 We'll be debuting a very special feature at the party, so come celebrate with the Blogger and Google Reader teams. Drinks, food, tunes, swag, and good times will be in full effect. Remember to bring your SXSW Interactive badge. See you there!